July 31, 2014 By Tina M 63 Comments This post may contain affiliate links. Read my disclosure policy here. My first daughter was blessed with amazing skin. I NEVER put lotion on her as a baby and her skin was always beautiful and soft. My second baby seemed to get hit with everything: bad baby acne, cradle cap, and some eczema on her legs. I was excited when I got the opportunity to try Cheryl Lee Products on her skin. Although it worked amazingly, I was hesitant to share on my blog because I don’t consider her case to be “extreme,” and I didn’t want to tell other moms to try it unless I knew for sure that it would help the most severe cases. So I asked 2 of my friends who both have sons with severe cases of eczema if they would try the creams and give me their honest feedback. They were both desperate to find something that wasn’t a prescription, that wouldn’t sting, and would actually work to heal their son’s skin. Since I’m pretty sure I have to put this disclosure on anything medical related, here it is: I am not a doctor, nor do I offer medical advice. This post is written from the personal experience of others. UPDATE: to read about my continued experiences with these products over a year later, see this post. My son has had pretty severe eczema his entire life. We have always used prescription creams to keep it clear, but he dreaded the medicine because it burned and stung whenever we used it. Non Prescription creams have never been able to touch it. The last 2 years his condition has been very mild – the doctor said he had probably grown out of it. A few months ago it appeared again out of the blue and it was worse than ever. I was given TrueLipids® Eczema Experts™ Anti-Itch 1% Hydrocortisone Barrier Cream by Kristina. I was super skeptical, because I’ve never had a non prescription cream work, but I was so happy with the results. The biggest plus for my son was the fact that it didn’t sting or burn when he put it on! We were diligent and used it every day. After day 2 I could see a huge difference. 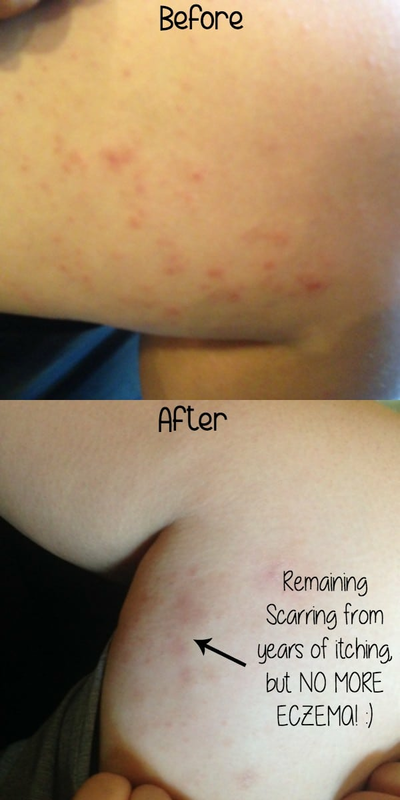 After a week the eczema was gone, leaving only the usual scarring from his itching behind. We used it for another week just to be sure, than began using the TrueLipids® Relieve & Protect Ointment. It has stayed clear and he hasn’t had any recurrences. Camden is 8 ½ years old and is a very active little boy. Eczema has been a problem of his since he was a baby. I first noticed a problem when he was about a month old. I had just given him a bath and put some scented baby lotion on him. He instantly cried and it wasn’t a normal cry. I knew then that it was irritating him. It wasn’t until about a month later that dry patches started to appear. Camden’s pediatrician told me he had infantile eczema and that he would likely outgrow it. His eczema primarily affects his ankles, the backs of his knees, and the inside of his elbows. Occasionally, he will have it on his hand and between his fingers. I have noticed that his eczema gets worse when the seasons change and when he is around a lot of dirt or gets sweaty. Camden is very active so keeping his skin clean and dry is a challenge. His skin itches all the time and I catch him itching the problem areas a lot. When he has flare ups, his skin gets very dry and red. It usually gets so bad that he will scratch the area until he bleeds and gets an infection. Since he has had this for most of his life, his ankles now have scars on them. I have tried anything I could think of for treating Camden’s eczema. The doctors have prescribed me numerous oral and topical steroids. They have told me to give him Benadryl at night to help him to not itch while he sleeps. He has been given antibiotics to clear up the infections he has gotten by itching as a result of the open sores. I hated giving him so many different medicines. I have tried essential oils. We have always used Vaseline to try to keep his eczema under control. None of these have ever worked long-term. With any medicine I was given in the past from doctors, I felt like his eczema would look better for a little bit, but never truly healed. I knew it would be only time before it was back. He has a hard time with anything scented on his skin. Sunscreen, bug spray or certain laundry detergents really bothered him. He still suffers from eczema and is old enough now that it really frustrates him. He feels different from his siblings and wants to have “normal” skin just like them. When he has had outbreaks in the past, kids at school have asked him what is wrong with his skin. I was very excited to try the Cheryl Lee sensitive skin care system. I have heard about it in the past and hoped it was something that would work for Camden. This is by far the best product I have used for him. We used the Eczema Experts morning and night. I tried to use the ceramide + cream and the skin protectant at other times during the day. After the first week, I saw significant improvement. The eczema on his arms and behind his knees cleared up. His ankles looked a lot better too. It’s hard to see from the pictures though. Before trying any of this, his skin was very rough. The skin on his ankles were especially rough and thick. After the first week, his skin was very smooth. I hadn’t remembered his skin feeling that smooth in a very long time. His ankles have been damaged by years of eczema and it was the fastest improvement I have seen. I know that his eczema is an ongoing problem. Summer is an extremely busy time for our family and I wasn’t as consistent as I wanted to be after the second week. I have seen with Camden’s eczema that if I don’t stay consistent, it usually comes back pretty quick. We had a couple of really busy weeks with baseball and it was hard for me to keep up on the creams. Camden was on three different baseball teams throughout the summer so the meant a lot of sweat and dirt. This would have been a disaster with any other cream I have tried in the past. I noticed that even if I missed a couple of days with the Cheryl Lee MD sensitive skin care system, I could put the eczema cream on at night and his eczema looked significantly better in the morning. His eczema never flared up to the degree it has in the past either. It seems much more manageable now. I feel like the one mistake I really made was by not putting the skin protectant ointment cream on Camden before he played baseball. I think this would have protected his skin from the dirt and sweat he encountered during baseball. Baseball is finished and I feel like a life is getting back to more of a routine. My plan for the future is to put the eczema cream on his ankles a couple of times a day until it’s cleared up a little better and then maintain his trouble spots with the ceramide + cream during the day and the skin protectant ointment at night. At this point, I only have to put the skin protectant ointment on his knees or elbows every few days and it’s mostly to prevent anything from coming back. I really feel like the longer I use any of the Cheryl Lee products, the less I will have to use them. I really feel like I will be able to maintain Camden’s eczema with the Cheryl Lee products. I have recommended the Cheryl Lee MD products to friends and will continue to use them myself. My only complaint would be the cost. It’s something that I will have to really budget for. I think it could be hard for a lot of families to afford to try unless they really knew it was going to work. I’m thankful I have finally found something that’s helping Camden’s eczema. He’s not a self-conscious about his skin anymore. If you want to try any of the products, click on the banner below (it automatically updates with any blogger special/discount currently going on)! This is totally awesome! I’ve had troubles with eczema my whole life and have more than enough scars to show for it! Thanks for the info and I’m going to check it out! My son had severe eczema when he was 3 years old. We tried numerous prescription creams as well as natural creams, etc. I finally took him to my dermatologist who suggested that we eliminate all dairy, oils with the exception of olive oil , and all nuts from his diet. We were desperate and immediately did as he said, causing us to basically consume a whole foods diet – no processed foods and very little eating out. Within just a couple of weeks, his arms, which were previously bleeding, had completely cleared. I am convinced that eczema, for some, is an internal problem – one that, in our case, could not be cured with external treatments. That IS THE way! The one and only.. Good that you found that Way: a very healthy one as well! I wish that more people w ill take more care for the internal.. That is the base (basis??. Sorry for my english). Vitamin K shot given at birth is the culprit of eczema in everyone who has it. Do your own research. Do not trust the FDA or CDC. No coincidences. Truth does not have to be proven. Awesome Tina! I sent the link to my cousin! I have a good friend who struggles with eczema. Would love to win this for her. what I learned is that her products are hyper allergenic and they will not burn the skin when they are applied this is something that I have been looking for my 3 year old has horrible eczema and had had it ever since he was 4 months old! i would love to win this! i have eczema on my hands and would love to try this. I love the idea of an alternative to steroids for my baby’s eczema. I would LOVE to try this. I do agree the cost is a bit high to be in our budget so I’d love to win the giveaway to try it out first. I would feel much more comfortable using this NON-TOXIC stuff on her than some of the other prescriptions we have. Hi Tiffany! I understand your concern with the price. One thing that is nice is our 30-day money-back guarantee. If it doesn’t work then we will take it back, no questions asked (as long as it’s still half full). That way you can try it without worrying it might not work. My one year old son has severe eczema. We see a dermatologist once a month and he uses 7 different kinds of lotion, some prescription, some not. Nothing really helps. I’m so nervous that the winter will ruin any progress we’ve made! It is especially bad around the eyes and I didn’t know that it was probably from allergies, which I read on her site. This would be a life saver for him. He can barely sleep from all the itching. Seriously he said itchy before he said mama! We are always looking for cures for illnesses when, often, we need to focus more on causes. It took 2 years of suffering with chronic sinus infections, fatigue, headaches, body aches, and heart palpitations that no doctor could explain before my suspicions were confirmed: The installation of numerous air “freshener” machines throughout the office I worked in made me horribly ill. The sudden devastating illness coincided exactly with the introduction of what I later found out were very toxic chemicals. Unfortunately these chemicals are also found in perfume, laundry detergents, dryer sheets, scented candles, etc. – they are literally everywhere! I am now so terribly sensitive to these chemicals that it is difficult to live a normal life. Be proactive and look for causes, as well as cures, for any illness you may have. I cringe when I see new product introductions of Frebreze or scented laundry detergents. These things are so toxic to people. You can even mention this in a nice manner to people with health or allergy problems. Yet, they are oblivious and keep buying the stuff that causes breathing and skin issues. Oh well, I will enjoy my scent free home! I was able to learn more about Keratosis Pilaris and that I what I have is considered more severe. I’ve been putting off getting treatment and I’m realizing that I need to take care of this asap. I LOVE these products so much! If you are hesitant then order some samples to try it. I promise they work though and have given me a lot of pain relief!! I think the controlled release is what truly sets this apart from other lotions. My daughter has had issues with Eczema, with almost no relief from anything. I will be trying this! Thank you! I think my daughters eczema is allergy related but one day when it wasn’t as severe we tried organic coconut oil and covered the entire area that was affected and in the morning it was gone! Could have been a coincidence. Thanks for your advice! You need to treat the gut of persons suffering from excema. My grandson had a severe case of excema as a young baby 6 months old. The doctor prescribed cortisol cream. I did not think this was a good idea for such delicate skin not to mention a young baby being given steroid cream. I went to a health food store where they advised the solution was simple. Give probiotics and fish oil. I thought I had nothing to loose. Being covered in excema and his skin feeling like leather we gave him a children grade dose of probiotics and fish oil. Costco has a great liquid probiotic where we placed drops on his pacifier. It was difficult to find the fish oil. We stuck with the probiotics and within a few days his excema was disappearing. Within a couple of weeks it totally disappeared. We kept up the regime even after it cleared up. There is no return of excema! I am reading this because my nearly 18-year-old son has had troubles with eczema since he was a toddler. We too, tried evey topical treatment imagineable over the years. But it wasn’t until we treated the INTERNAL reason for the outward symptom (the eczema), we never got true healing. Please consider this. I pursued this with his pediatrician, a pediatric dermatologist and regular dermatologists, allergists, and family practitioners. He was allergy tested, biopsied, food restricted, put on steroids, prescribed bleach baths ( :0 ), told to bath daily, then told to bath as infrequently as possible, and by the age of 10 had taken to wrapping his hands in rags at night so that he couldn’t scratch. Broke this mother’s heart to see him suffering and scarring himself with the endless scratching. Bathing/showering became a painful nightmare. The water hurt his raw wounds. I lived in constant fear he would get a massive infection (like MRSA) due to the open wounds. But one trip to a naturopath changed it all. He got a proper diagnosis, a naturopathic oral treatment AND a supplement and vitamin regimen that HEALED 99% of his rashes. And there was not a single ointment, lotion, or topical potion involved! Love that this ointment you are talking about seems to help so much. But please also consider internal healing! I’m interested in knowing what oral treatment the naturopath gave you for him. Thanks so much. Pamela Anderson, I’m 45yrs old and just got eczema 6 months ago. It has scared my legs, one ankle so far, my hands, and various parts on my torso. I went to a dermatologist who prescribed me a steroid cream and that was it. No diet change or food allergy test. Just told me I would have to deal with it the rest of my life. Please if you would not mind, share the information about the naturopathic oral treatment and vitamin regimen, as the lady before me, Bunny, has requested also. Thank you . I tried everything under the sun. Nothing worked until I started taking cod liver oil capsules, turmeric, and eating raw sauerkraut. I think it’s mostly the sauerkraut that does the job because it has trillions of good bacteria. I have suffered eczema my whole life – I have no doubt that the cream would work and would be a lot better than most creams Dr’s would prescribe, but like Britt and Pamela – it has to be dealt with internally. Like Pamela’s son – showering and sometimes even going outside in the air was a chore because the water and air would hurt the open cuts so badly. I have heard sauerkraut is amazing and am in the process of making my own. It hasn’t been so bad in the last few years (after visiting a chinese medicine lady) on my body however, I am still dealing with it on my face. I would try the cream, but I am very skeptical because (as usual with everyone else) the cost involved. Nossa eu estou precisando muito as minhas eczemas etão me deixando louca, há dois anos sofro com isso,como faço sou do Brasil.? I have developed eczema on my legs as an adult and have been frantic to find the root cause. Seems gluten and dairy are culprits. I went to a naturopath, got on a regimen to alleviate candida, leaky gut and inflammation from my system, and a modified paleo diet seems to work the best for me. Blessings on you and your family as you do your utmost to find a cure! Unfortunately there is no medical cure for eczema. Eczema starts with the gut. Google GAPS diet. I have been on a voyage to cure my son. We’ve tried sooooo many creams and oils. I’ve finally started to see it lift! He is 2 and drs and allergy specialists said he would grow out of it by the time he was 6-8 years old….. I can’t let him sit and suffer for another at least 4 years. You need to fix the gut flora first. My granddaughter suffers with eczema, my daughter in law researched and found she had food dye issues. She can not have tomatoes, some fruits, and mostly paprika which put in a lot of foods for color. So we watch what she eats and are able to control portions and she stays mostly clear. I saw this on Pinterest today and just had to click over and see what the “latest” thing that someone says has worked..This is going to be a LONG comment, but it will be worth it if you or your children are suffering..I had eczema A LOT as a child – all over my legs and elbow creases. They told me I was allergic to my animals, but it would go away during the summer and then return in the fall, I do believe it to be some type of allergy or deficiency, but never could figure out if I was just allergic to winter, because each year around Thanksgiving is when it would flare up…I am now in my 40’s and still suffered until I became vegan 5 years ago, when it disappeared COMPLETELY. I still get bouts of psoriasis on my scalp, but it does not bother me like the eczema did. I am sure you are thinking that is great and all for you, but I am not giving up on my dairy and I love me some steak. LOL. Well, to each his own, but keep reading, because it starts to get interesting….Well, it just so happens that my 13 yo daughter started getting signs of it on her neck about 2 months ago. I began my research all over again, and most of what I read was that it was probably triggered by puberty. She was NOT excited to hear about the P word..but nonetheless, there it was. It slowly creeped onto her face and covered the upper part of her eyes and eyebrows and her upper lip, and almost completely covered her neck. She is vegetarian, but does not drink milk either. So, I was really at a loss for why she was getting this. I am not one to run my kid to the doctor as I can usually cure things with most of my home remedies and I kept asking her if she wanted to see a doctor and she refused. Taking a teenager to the doctor when they don’t want to go, is not fun, believe me…they won’t say a word. So, I tried all my home remedies, essential oils, herbal teas, facials and even went to the health food store and picked up a little bottle that claims to cure psoriasis and eczema, so like everything else, we tried it. And like everything before, the first few days it seemed to be working, but then would stop working and start itching again. She tried apple cider vinegar for the itch, which worked only temporarily. She was drinking a cinnamon tea that was designed to help with healthy skin and you could tell on the days she forgot to drink it as the patches would be much more red. So, my search continued. I then talked to the manager at the Natural Grocers, about it. The first thing he recommended was getting off dairy – already done. Stop eating eggs – already done. Then he recommended the tea – already done. So finally he said get her on a Probiotic. So we went home and started “Nutritional Now PB8” vegetarian formula. Within 48hrs you could see it getting lighter, which we were used to, but then each day it got even lighter and the dryness started to fade as well. She only takes one a day and has been going for about 2 weeks now and her top lip is back to normal. Her eyes are no longer red, but still have a few very small dry patches. Her neck has cleared up completely on one side and the other side is no longer red and the patches that are left are half the size they were before starting the probiotic. I started taking it when I saw that she was clearing up significantly and I noticed that my psoriasis has gone away as well. So before you take slather more creams, gels, steroids and such, try a probiotic. It might just work!! Good Luck! I lived with this for over 25 years. Tried many things to try and fix this with little success until I had a skin allergy test. This showed I was very sensitive to sugars – lactose sucrose fructose – to varying degrees. I am now 58 and so thankful for that test as I’ve had the rash under control ever since. No more scratching or bleeding. Where did you do the allergy test? These creams were not around when I was a kid. My mom used to make me wear white cotton gloves to bed. But, we found that if she put zinc oxide ointment on the areas and wrapped them in plastic wrap at night, the next morning it would be almost completely gone. I’m 60 and still break out in the summer when my allergies are really bad. After being diagnosed with eczema I went to a dermatologist and had allergy test done and found that I was allergic to formaldehyde (seriously) I found out that it is in beauty products and on new clothes. As soon as I stopped using them the rash went away. No cream needed. The ONLY thing that worked for my 2.5 yr old daughter was eliminating ALL gluten and dairy from her diet. Her exzema was completely gone within 2 weeks. Very good and useful article ! Exzema is an autoimmune disease that is related to the gut. Basically, you need to find out what food sensitivities/allergies that you have and avoid them. My son is allergic to wheat, dairy, and egg whites. If he eats these things he gets those little bumps on his arms and legs and an itchy rash in the bend of his arms. External medicines don’t correct the problem, they can only mask it. Agreed, find out what causes it. 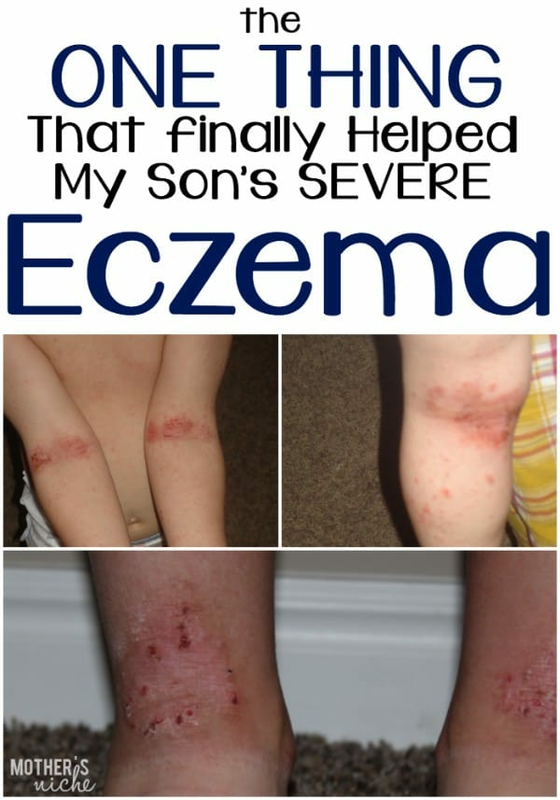 My son developed eczema all over his body and for several months we tried all sorts of topical stuff along with essential oils, changing soap, herbal teas, etc. Evening primrose oil applied topically and Epsom salt baths helped with healing, but didn’t make it go away. Allergy specialists said it couldn’t be diet, but when we cut out eggs, it finally started to clear up. Skin problems often mean intestine problems. He started digestive enzymes and probiotics after a visit to a naturopath (that he’s still taking) and the eczema hasn’t been back. You can treat topically, but you also need to find out what’s causing the eczema. Will it work on psoriasis? Have you ever tried a bath with seasalt? My mom had bad eczema and prescriptions only made here skin so thin she couldn’t tough us anymore (we were about 8-10 yrs old at the time). During a holiday at sea, where she swam every day a bit in the sea my mum noticed her eczema slowly went away. She continued back at home by dissolving seasalt in tapwater and after a while the eczema was gone. She had eczema mainly on her hands so she could soak her hands for about 15 minutes a day. My son is 10 years old now and FREE from eczema. I did not use steroids because the eczema only comes back worse after using creams with them. My sister gave me a book written by Dr. John Pagano. He studied psoriasis and eczema for over 40 years, and came up with an amazing diet – I don’t like that word- that cleans the child’s body from inside out. Creams and lotions are only palliatives that take care of the consequence. The body needs to be clean from the toxins that are the CAUSE of both eczema and psoriasis. Try that, and I promise you won’t regret. All three of my children have suffered with eczema, and all three needed something different for healing. As a baby, the doctor had me slathering their little bodies with the oily A&D (not the white kind). That stuff was sure good at keeping a barrier on the skin, but it did not heal the eczema. My first son outgrew his eczema after a few years. My daughter has had eczema so bad that she eventually developed a MRSA infection and her skin began falling off in pieces. She now has to avoid any lotions, soaps, creams, or ANYTHING on the insides of her elbows, which is where she had the eczema. She eats organic and all her food is from scratch. (This, and a lot of prayers, has also helped her epilepsy.) Her eczema has all but disappeared. My other son suffered so much with eczema all over, his trunk being the worst of it. Poor guy. We took him off of all dairy for two weeks, then slowly started him on dairy again. Like magic, the eczema has disappeared when he initially went off the dairy, and it never returned. Unfortunately, a year or two later, he began having other issues associated with dairy (e.g. severe leg pain, abdominal pain, foul gas, etc.). Now that he is dairy free, he is feeling great! I also have a friend with eczema. Nothing has helped her thus far, and she has tried every remedy and medication in the book. Hers appears anywhere she sweats (think bra line, etc.) and on her fingertips. Any moisture makes it worse, so she has to limit hand washing and baths. Even so, nothing has helped eliminate it thus far. Isn’t it funny how everybody is so different? It makes me wonder whether all these things doctors call “eczema” are really the same affliction or whether they are completely different by manifest similarly. So, my advice for people with eczema is to experiment. While something may work for one person, it may not work for you and vice versa. Keep looking until you find something that heals the eczema, or at least controls the symptoms and eases discomfort. I totally agree! My daughter had cradle cap as a baby and we got rid of it with coconut oil. When my son was born 3 months ago and also had cradle cap, we did the same thing and it made it much worse! We moved on to head and shoulders shampoo, and then to a prescription from the doctor. Nothing was working. Just last night I tried the TrueLipids and it already looks better than it ever has. I should have known better to try it earlier since I still had leftover cream from my daughter’s eczema. Makes me wonder if cradle cap is also a variety of different things! I’m glad that worked for you. I’ve eliminated foods with my son and even took him for allergy treatments to see if that was it. Coconut oil (which works for everything else for me) exploded the problem and made his eczema so much worse. This cream worked in a matter of days. I would try an elimination diet. Eliminate common irritants , just Google them.then start adding them back in gradually. Dairy and gluten are common culprits. Try natural oils like coconut or olive oil. A friend’s baby was pulling his hair out he was so itchy. I suggested olive oil and it worked really well.I would use steroid cream as a verrrry last resort. As soon as we found out our son was allergic to peanuts/tree nuts and other allergens, his excema cleared up. There is a reason for it and I believe cream is a temporary fix in our circumstances. national excema foundation. Sorry you all have the painful skin conditions. STOP!!! Your children will have steroid withdrawal if they continue to use steroid cream. My brother was going through steroid withdrawal after years of using hydrocortisone on his eczema. It is a million times worse than eczema…. he finally cut out dairy and gluten and his skin is PERFECT! There is no cream that will help, they only cause more problems long term. Skin issues ALWAYS come from diet. I have severe eczema all over my legs. I used foderma serum for about a week and my eczema improved so drastically!! That’s not eczema! That’s yeast infection in his gut! My son had that recurring until we treated his gut. If your kid looks like this go see a naturopath, not family doc. Please consider this, do some reading and educate yourself on this. If you treat topically, all your doing is allowing the infection to destroy sons health. Are you sure that this works? Sorry to sound skeptical but between my daughter, her mother in law and myself we have tried so many so called cures for my three yo grandson who suffers from eczema all over his body. It’s heart breaking to see, especially when it gets infected and weeps. We are desperate to find a solution. I almost forgot i also added probiotics to his formula. He is lactose intolerant so as you know any kind of probiotic has live bacteria. My baby was allergic to even plant based probiotics. It wasn’t until I found this drink called mycotea which is living mycelium anyways this was they only one that didn’t give my baby a reaction like diaper rash. I’d shake it and add like 5 drops too his daily batch of formula. Hope both my comments are helpful to someone.